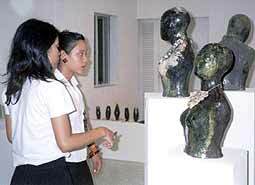 The Faculty of Fine Arts, Chiang Mai University, organized a “Craft Arts Exhibition”, displaying ceramics and ornaments to run between June 15-28, 2005, at the exhibition room of the Faculty of Fine Arts, Chiang Mai University. Ornamental crafts displayed at the Craft Arts Exhibition. On June 15, Assoc. Prof. Mom Luang Surasawat Sooksawat, dean of the Fine Arts faculty, presided over the opening ceremony of the exhibition. This exhibition gathered handicraft artifacts created by students of the fine arts faculty studying ceramics and jewelry. Last week saw great excitement at Baan Pa Mai Daeng School as Thailand Under 13 Coach, David Buck presented newly selected player, Supakan Somboon with his sponsored equipment. Supakan was departing for Bangkok to train with the Thailand Under 13 side. This side is due to play in Malaysia in the forthcoming Ja’afar Tournament in July. Supakan Somboon holding on to the kit presented to him by David Buck, director of coaching, C.M.S.C.A. Also present Principal Ajarn Kanit Chailangka, sports teacher Ajarn Pirun Pongsuk and teacher Ajarn Supaporn Suwanna. Supakan started his career under the guidance of softball coach Eric Little and in a very short time progressed to the hardball arena. This school has produced a further five boys who have been selected for the Chiang Mai Under 13 squad, thanks to the support and hard work of their Sports Teacher Ajarn Pirun Pongsuk. Over 40 children at this school have shown tremendous interest in the game. Chiang Mai Schools Cricket Alliance is delighted with the progress that is being made in the Doi Saket Schools. The photo exhibition “Mysterious Mekong: A journey through the heart of Indochina” will be displayed at the lobby of the Chalerm Prakiat Building on the grounds of the Siam Society in Bangkok on June 30 in conjunction with its Annual General Meeting. The exhibition, which will last until July 20, was compiled by Reinhard Hohler and dedicated to the German explorer Dr. Adolf Bastian, who traveled on the river in 1864. “Hovercraft Expedition Mekong” was co-organized by Diethelm Travel and the Brooker Group in Bangkok on November 2-17, 2002 and covered nearly 3.000 km of the river from Simao Port in Yunnan to its delta in the southern part of Vietnam. As the seats for an Australian film crew on the return journey were cancelled because of the Bali bombing accident in Indonesia, tour director Reinhard Hohler made it alone back to China. In his photo exhibition “Mysterious Mekong”, Hohler will position, protect and promote the different geographical and economic aspects of the river. On show will be a map of the river plus 72 well-selected photos to demonstrate the successful outcome of the expedition. The 72 photos - available on CD - will highlight the expedition via Jinghong in China through Myanmar, Laos, Thailand, and Cambodia to Ho Chi Minh City in Vietnam, displaying the hovercraft, the six members of the expedition and the river scenery of the Greater Mekong Sub-region. The transfer of the hovercraft around the Khon Falls in Southern Laos will be dramatically exposed. Besides a spectacular side trip to Angkor, there is also shown the gravesite of the world-famous French explorer Henri Mouhot in Luang Prabang to give the exhibition historical notes. Preparations to hold the exhibition were completed after its opening ceremony at the Sheraton Chiang Mai Hotel on March 25 for the PATA Mekong Tourism Forum 2004. The display of the exhibition was mainly sponsored by the German Embassy in Bangkok. It has already been to other venues, such as the L’Ecole Francaise d’Extreme-Orient Chiang Mai in January 2005 and the Sofitel Royal Angkor Hotel and Spa at Siem Reap/Cambodia in March 2005. The Siam Society under royal patronage since 1904 and is located at 131 Asoke Road, Sukhumvit Soi 21 and in easy reach of the MRTA underground system and the Skytrain. Open from 9 a.m. – 5 p.m. on Tuesday to Saturday. Ajarn Sujit Nokum, ex-education officer from Amphur Doi Saket and owner of Mae Ping Agriculture is teaching Ban Sabai Spa how to preserve the Chiang Mai environment, using Development Micro Organism (D.M.O.) for cleansing, planting, plant fertilizer and pesticide and also how to use recycled waste water at Ban Sabai Spa. (Front) Chitra and Ajarn Sujit Nokum surrounded by the Ban Sabai Spa team. If you use D.M.O. to plant, the microorganisms will change the soil to a higher quality by producing nutrition for plants while they are better protected from disease. D.M.O. is free from toxins and chemicals and saves costs and it is not dangerous for the health of the producer and the consumer and safe for the environment. For more information about D.M.O., call: 0 5325 5599. The YMCA is inviting young people to join in Peace Building, Youth Employment, Holistic Education and HIV/AIDS Prevention activities. Any young person aged 18-30 years old and able to communicate in English, by reading, writing and speaking qualifies. Any youngster wishing to join in these activities can ask for more details and an application form at counter service of Chiang Mai YMCA (Santitham) or call at 0 5322 1819-20, #1102, 1104 or every branch of YMCA office. Deadline to present the application form is on June 30, 2005.